Just about everything is developing a powerful, consistent swing path begins with body position. If the body is not where it needs to be, you can do whatever you want with your hands and the swing won't fall in place. 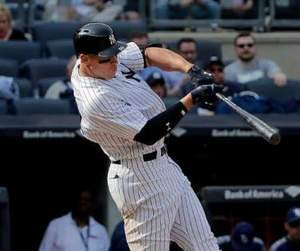 Today I want to discuss the importance of spine angle, that is the position of the upper body from a side view from the beginning of the swing through contact. What should the spine angle look like? Notice how each one of these hitters is slightly leaned back with their upper body. The degree to which they lean back is dependent on each hitter. Look at the picture below. Both hitters have some lean back, but Chris Davis is leaned back much more than Ichiro Suzuki. Why? It all has to do with the type of hitter they are. Every successful hitter uppercuts and has an upward path to their swing. The degree to which they move the bat up varies slightly from hitter to hitter. Chris Davis is one of the most prominent power hitters in the game and makes his living by hitting the ball over the fence. Therefore, he works up more to the ball than most hitters. Ichiro on the other hand has made a hall of fame career by hitting line drives. His bat path, while still very much working up, is designed more to slapping singles all over the field. I use these two hitters to showcase the 2 ends of the body position spectrum. Most hitters are not as big and strong as Chris Davis and cannot launch balls at a 45 degree launch angle over the fence. Likewise, most hitters do not possess the bat control and speed that Ichiro does to almost begin running out of the box as he makes contact. Just about every hitter should fall somewhere between these two when it comes to the amount that they are leaned back. Why is leaning back important? If you look at the Chris Davis and Ichiro pictures, you should notice that the bat path (yellow line) is perpendicular to the spine angle (blue line). This simply means that the most powerful, efficient bat path a hitter can produce should match the spine angle. Chris Davis swings at a steeper angle because he leans back more, and Ichiro is less upward because his spine angle is a little straighter. Why do young hitters tend to swing level or down? Because with an upper body that is leaned forward (Lunging), the most efficient path is down. Without the upper body leaned back, a hitter cannot create a powerful upward bath path that is essential to being a successful hitter. This drill is one of my favorites for helping players feel their spine angles. Align the tee up in the center of the body instead of out front. Try to and drive the ball in the air. This will force the upper body to stay back and not get out front.